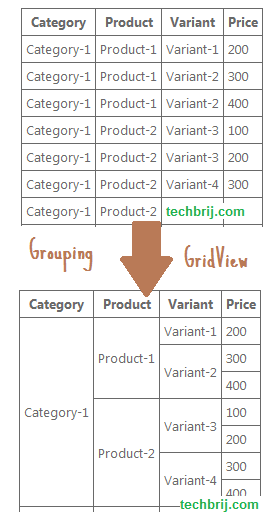 I have created a generalize method ‘GroupGridView‘ to group data in the gridview. startIndex: index of first column to be grouped(where to start grouping). total: total number of columns to be grouped. Before using this method, Make sure data is sorted in same order in which they are to be grouped. Bind the gridview and Pass the gridview rows, start index and total number of columns to be grouped in GroupGridView method and enjoy it. The above code will group first 3 columns of gridview. Hope, It’ll save your time. Thanks, that was very helpful man! Thank you so much, you’re saved. This is an excellent piece of work that saved me hours. Thank you very much! I was looking for it for hours!